Today is Payton's second birthday. Wow, this day brings a whole lot of emotions back to the surface. 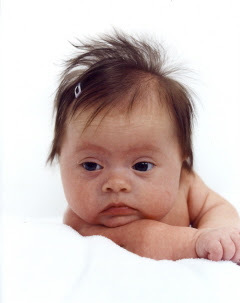 Two years ago, we learned that our precious baby girl was born with a little something extra ... Down syndrome. We were blown away ... we wanted to know how this happened to us ... we weren't sure how this was going to change our lives. Today, I can answer those questions for myself, and others who might be interested. Why did this happen to us? I'm not sure why God chose Kyle and I to be Payton's parents, but we could not be more honored. Many people say, "God doesn't give you more than you can handle." I believe that is true. Sure, I wasn't so sure in the very early days, but we got through it and are now stronger than ever. How has having Payton in our lives changed us? Only for the better, that is for sure. She has taught us so many things. While the majority of society thinks she is far from perfect, we happen to think that she is perfect. We would not change one chromosome in her little body. Her spirit for life makes you realize that many of those other things that people dwell on just do not matter. HAPPY HAPPY BIRTHDAY PAYTON!!!! We love you! Happy Birthday!!! I hope your day was wonderful!